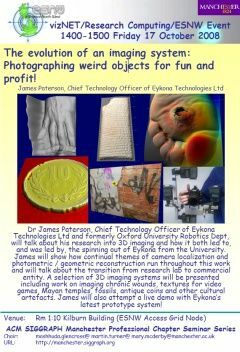 Dr James Paterson, Chief Technology Officer of Eykona Technologies Ltd and formerly Oxford University Robotics Dept, will talk about his research into 3D imaging and how it both led to, and was led by, the spinning out of Eykona from the University. 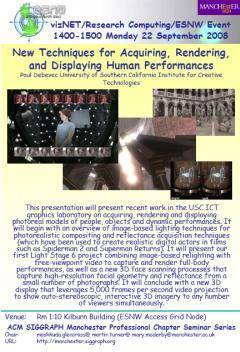 James will show how continual themes of camera localization and photometric / geometric reconstruction run throughout this work and will talk about the transition from research lab to commercial entity. A selection of 3D imaging systems will be presented including work on imaging chronic wounds, textures for video games, Mayan temples, fossils, antique coins and other cultural artefacts. James will also attempt a live demo with Eykona' s latest prototype system! Most of these meeting are Access Grid enabled. Anyone wishing to view a seminar via Access Grid should note the following. Please check the Jabber room shortly before the start of the seminar to find if ScreenStreamer is to be used. * Preferably use ScreenStreamer software - go to http://www.memetic-vre.net/software/ScreenStreamer/ScreenStreamer.php and select room "University of Manchester (1.10)" from the AGSC section. Grab the screen feed (by clicking on it) from the screenstreamer window and resize it - more info can be found on http://www.memetic-vre.net/software/ScreenStreamer.